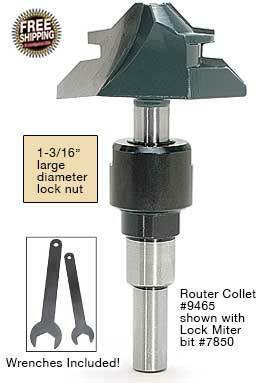 The MLCS Router Collet Extension was reviewed in Fine Woodworking® #159. Give your router bits an additional 2‑1/4" (for #9465 or 2" for #9473) when you extend them through the router table top with our router collet extension. Eliminate the dangerous temptation of withdrawing the shank from the collet in order to raise the bit and to "provide the full depth of cut." 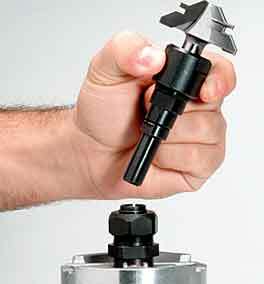 The router collet extension makes it possible to use all diameters of 1/2" and 1/4" shank bits safely. Place the router collet extension shank in the 1/2" router collet and the router bit shank in the extension collet and tighten both. Wrenches and instructions included. Collet Extension for 1/2" shank bits includes 18mm and 28mm wrenches and the Collet Extension for 1/4" shank bits includes two 18mm wrenches. Note that for previously sold item's #9464 and #9468 the large diameter is the same as in the chart below. NOTE: Will not work with 1/4" collet routers. WEB SPECIAL! 5 Piece Set. 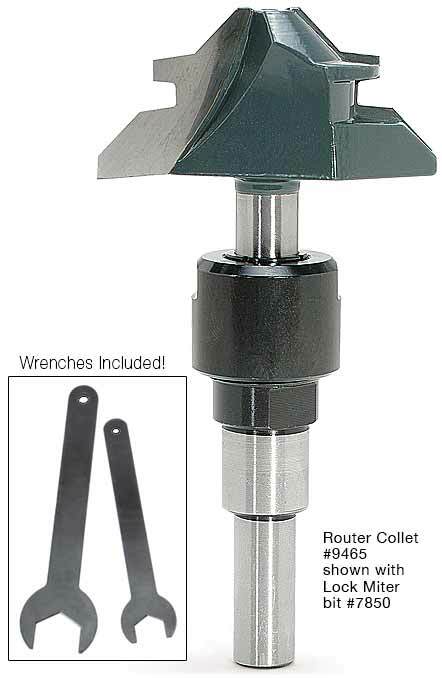 Wrench Sets for previously purchased Router Collet Extensions are now available for both 1/4" and 1/2" shank below. The 1/2" shank set (#9466) includes 18mm and 28mm wrenches and the 1/4" shank set (#9474) includes two 18mm wrenches. I too had a hard time releasing bits. Then I put extension in wood vise, take collet nut completely off, tap flat screw driver down from the top in each slot and the bit falls out . Screw nut back on and ready to go again. Just got to spread the collet out slightly to release grip. I bought the 1/2 inch version and use it when I wish to use a short bit - usually in ply [single or multiple glue up] - to clear clamps and everything else. It works fine. That means for my use, I can use cheaper bits. I wish that they would tell us what collet size is used, or make it compatible with ER collets. That way I could use it to drill [drill bits] with various sizes on the CNC. MLCS - any answers to this one? I do not wish to "experiment" to find out. I am sad that even though the problem of getting the bit out of the extension was first mentioned 8 years ago it still has not been fixed. I clamp the bit in a wooden jawed vise, and tap on the extension with a leather wound hammer. MLCS NOTE: The collet extension is not designed to be self-releasing as this would be a safety hazard. Couldn't be happier with this purchase. The 1/2" to 1/4" extension is perfect for the guitar binding rabbet set sold by many Luthier (guitar making) suppliers. It allows the necessary height for using in router tables, and runs very true. My first test cut was perfectly smooth and very accurate. Fit and finish are excellent and the included wrenches are a nice touch. Packed well and shipped in acceptable time. I purchased both extensions. I used the 1/2" first and was unable to get the collet to give up the router bit. I had to clamp the bit between 2 pieces of wood (with extreme pressure) and pry the collet away. tapping on it only drove the bit in deeper. Not a happy camper. Afraid to use the 1/4" extension. MLCS NOTE: This collet is not self-releasing for safety reasons. 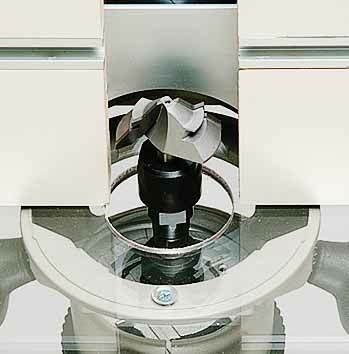 Tapping on the side of the collet nut with a mallet should allow the bit to release safely. I have found that most shafts are larger at the top undersise of the cutters. Therefore when I change bits i pull up on the bits about 1/8" and hold it there when i snug up the collet. This makes the bit come out without tapping the extension. Also I want to find a thin rubber washer with a 1/2" I.S. diam.and slide it unto the bit shaft before placing it into the collet. I think this will also stop it from binding. The "Collet Extension" does the job for which it was intended,However you have one heck of a time removing the bit. The Extension refuses to release the bit. a real pain in the neck. MLCS NOTE: For safety reasons, the collet extension is not designed to be self-releasing. After loosening the collet nut, a quick tap on the collet nut with a wrench will cause the bit to release. Perhaps I am a tad bitter that I did not receive wrenches with the two extenders that I purchased, but my biggest problem with this set is that the collets do not cough up bits easily enough. When I have to unthread the collet almost all the way for a whack on the side to unseat a bit--and sometimes it takes more than that--I am not inclined to give these collets high praise. They do seem to be very free from runout, though. Perhaps if I had received wrenches, I might have rated these four stars. MLCS NOTE: This customer ordered a lower priced version of the collet extension before we offered the wrenches as part of the package. These extensions work fine. My only gripe is that I have to dig out two wrenches every time I use one because they weren't included when I got my set. The extension works as advertised. The only problem is in removing bits from the extension. I eventually "hit" on the solution - loosen the collet nut on the extension, then tap on the bottom of the extension's shaft with a hammer (lightly). The bit will pop right out. I purchased this extender to make deep cuts in oblong dishes using a template and bushing. The diameter of the collet is to wide to use with any bit less than 1 1/4" to a greater depth than can be made with a normal router set up. I will just buy a 1 1/4" dish cutter and it should work fine. Just be aware of this limitation. This extension is a great idea. It allows me greater flexibility when I use my router table! Now I can use bits that would not clear the table top without raising them unsafely in my router's collet. Well worth the price! I only wish I had bought them as a set. I use both the 1/4 and 1/2" extensions in my router table. They have made all the difference in the world in the ease of changing bits and obtaining the exact height I want. At first I tried changing bits while the extensions were still in the table but found it easier to pull the extension and change the bit out of the router. I only gave the extensions 4 stars because I found it difficult to remove bits that were narrower than extension collet nut. On most bits as the nut is loosened it pushes the bit out of the collet, but on a bit that is the same diameter or less than the collet capacity, the nut slides past it. I've had difficulty freeing these bits from the collet. This issue aside, I like the extensions alot and use them constantly.